may love rule. time is now. What a blast that was! Thank you everybody who participated and made the film happen! Thank you audience for the applause and beautiful feedback! Thank you Arte! Years ago I interviewed a female concentration camp guard. That women was charged for aid for murder. At the time of the prosecution I was traveling and not taking care about news and the world - the articles in the press just passed by me. The indictment was discontinued due to lack of evidence but in 2016 the appeal was resumed and, until now, it is floating in the open. After the screening of What remains someone came up to me and told me about it. And it turns out that my material contains new details and facts which underline her involvement. I am very curious about how the prosecutor will decide: if he will take the case on trial or let it just fade out. Like so many other cases - too many other cases. Our documentary is still being screened - after completing it 9 (!) years ago. We are happy to go to Northern Germany at the End of September and be part of the 12th German Memorials Convention. You find the english subtitled version on: www.wasbleibt-film.de. So many years ago I caught my first fish. After hours of sitting next to uncle Karl, who gave me the fishing rot and showed me how to put the earthworm on the hook. 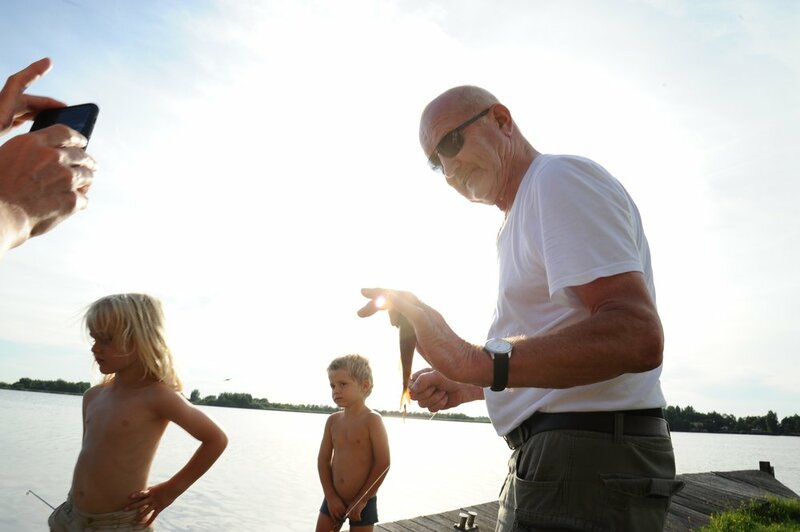 So many years later my sons first little fish, and a wise uncle Karl who pretended it is the biggest fish he ever saw in his life. The beauty of things never changing. if someone is stepping on a balcony it seems like they disappear for a second the moment they lean over the facade. They quickly reconnect to their own world. Its magic to me. the moment you see your son and you stop breathing because it could have been you. a long time ago, but in that second, time does not exist. And there we were again. Exposed to different lives and cultures and adventures. 767.023 - so many people hit and viewed our little Bobby Hebb movie! I am THRILLED!! This is so cool. THANKS! You find it if you scroll down a little. Finally we continue shooting our documentary woMEN (wt) about the sworn virgins in Albania. On the picture you see Marta, she is 92 years old and she has been living her life as a man for 75 years now. Bardie, on the picture below, has become a sworn virgin by the age of 17. I am still impressed. Sein berühmtes Lied SUNNY ist nun 50 Jahre alt und Trocadero Records hat zu diesem Jubiläum mit unserem Material ein kleines Filmchen geschnitten. In Memory of the great Bobby Hebb. Enjoy. His famous song SUNNY is 50 years old now and Trocadero Records edited a little movie out of our material for this jubilee. In memory of the great Bobby Hebb. Enjoy. Ich freu mich. Die Journalistin und Autorin OKKA ROHD hat auf ihrem Blog SLOMO eine Liebesliste von mir veröffentlicht. Danke, Okka! OKKA ROHD published an interview with me on her Blog. THANK YOU! Gesa Knolle und ich werden nach dem Screening um 19:00 zum Gespraech dort sein.